Dog Intelligence: What's Going On Inside Your Dog's Mind? Intelligence in dogs can be defined as the ability of a dog to learn new behaviours, and to work out how to solve problems. Most dog fanciers agree that there are three types of intelligence in dogs – instinctive intelligence (the ability to do what they were bred for), adaptive intelligence (the ability to use their past experiences to solve problems) and obedience intelligence (the ability to learn behaviours in response to training from their handler). Dog experts and owners alike seem unable to agree on how to measure intelligence in dogs, because like people, individuals can be clever in different ways. There is no argument that a dog that learns obedience commands quickly, and performs well in obedience competition, is extremely intelligent. However, dogs such as the Beagle, that aren't known for their obedience success, are extremely talented at following a scent for many miles. That is a different type of intelligence. The ability to learn quickly is a characteristic that is important to those who own working dogs, such as Border Collies and German Shepherds. Breeders have often chosen the smartest dogs for their breeding program, which has resulted in a general increase in the ability of their offspring to learn. With other breeds, obedience has been less important and breeders have carefully chosen dogs that have a good nose, such as the Bloodhound, or that can run extremely fast, for example the racing Greyhound. Personality plays a big role in apparent intelligence in dogs. When it comes to problem solving, some individual dogs have a lot of drive, and won't give up. Other dogs quit, and they don't appear quite as clever. Some breeds and some individuals are keen to please their owners and will work hard for their praise. Others are aloof, and aren't too bothered about doing as they are asked. They may be just as smart, but look like they are a bit slow. Stanley Coren is a professor of psychology in Canada who has studied canine intelligence. He sent questionnaires to many dog obedience judges, asking about their experiences with various breeds, and collated their responses. This information was used to list the breeds in order of their intelligence. Border Collies, Poodles and German Shepherds filled the top three positions, while the tail end of the field featured Borzoi, Afghan Hounds and Chow Chows. 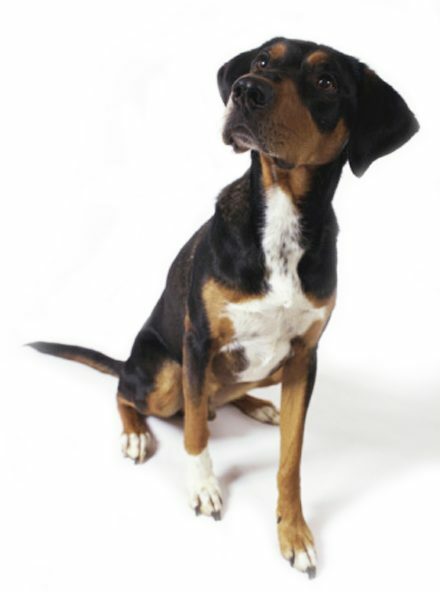 Breed order was based on a dog's ability to understand new commands and obey them, which didn't take into account instinctive or adaptive intelligence. Dr Coren owned a Beagle, which at number 73, is far from the top spot on the dog intelligence list. He also owned a cat, which was fed on top of the kitchen bench so the Beagle doesn't steal its food. One day, the Beagle started digging and scratching at the floor near the bench. He looked up at his owner, then started scratching again. Dr Coren couldn't see what was catching his dog's attention, so he got down on his hands and knees to have a closer look. His little Beagle immediately jumped onto his back, and up onto the kitchen bench where he helped himself to the cat food. In spite of the Beagle's supposed lack of intelligence, this dog certainly demonstrated the ability to problem solve. It is fair to say that a dog's owner has a huge impact on their pet's perceived intelligence. A dog that lives in the back yard, where their only interaction with their owner is when they are thrown a bowl of food, won't learn as much as a dog whose owner is more involved in their day to day life. A dog owner who invites their dog into their home, and takes the time to teach him a variety of behaviors and commands will result in a dog that appears very clever, no matter what their breed. Alpha Dogs: Do They Even Exist?